When you (or someone you know) is facing a DWI charge, it can feel like your whole life just came to a screeching halt. All your life's plans, hopes, worries, and expectations suddenly take a backseat to this new, lurking monster that suddenly took the wheel in your life and is hell-bent on driving you off the road. Will you go to jail? What will happen to your insurance rates? What are the consequences of a criminal conviction? What will happen when I go to Court? How will I drive to work without a license? What will my children think of me? How do I look at myself in the mirror after something like this? Some of these thoughts (hopefully not all) run through the minds of everyone who is arrested under suspicion of driving while impaired. And all of them are very, very good reasons to hire a defense attorney to help you navigate your way through the mess of a criminal case and the major disruption that comes from losing your license. That's why we're here -- at Ramsay Law Firm we've dedicated our careers to helping people who are charged with DWIs. And with that dedication has come many, many awards: Dan Koewler regularly makes the Super Lawyers Rising Stars List, while Charles Ramsay achieved the prestigious "ACS-CHAL Forensic Lawyer-Scientist" designation from the American Chemical Society (the only attorney in Minnesota to do so). Charles was also designated as "Attorney of the Year" by Minnesota Lawyer back in 2011 for his work in combating Minnesota's old breath test machine. History tends to repeat itself; old success leads to new success. 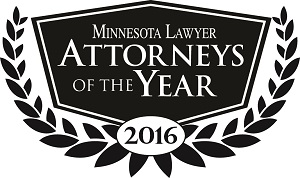 That's why I'm happy to announce that both Charles Ramsay and Dan Koewler were just selected as 2016 Attorneys of the Year by Minnesota Lawyer, alongside other well-respected attorneys such as Ron Rosenbaum and Joe Friedberg. As this is Charles' second time being selected as Attorney of the Year, this also means he is now at the incredibly rare "Circle of Excellence" level for Minnesota lawyers. Congratulations to every attorney that was selected (we're including each of their names below). At Ramsay Law Firm, we're already looking forward to helping even more clients and winning more cases in 2017.